New York’s Canals are lined with communities whose past and present are inextricably linked to that of the canal. At the Canal Corporation, we recognize that economic prosperity begins at the local level, and that each canal community has a story to tell, which when woven together with other canal stories, creates an unparalleled legacy and world class destination. All across the system, corridor residents are creating, building and strengthening the connections that link their communities with the canal. The Canal Corporation provides support and technical assistance as well as financial assistance through small matching grants when funding is available. We work in concert with Governor Cuomo’s Regional Economic Development Councils and Consolidated Funding Application (CFA) to help canal communities and not-for-profits seek government funding for canal projects and to maximize the potential for private investment. 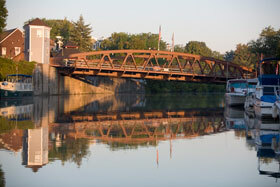 The Canal Corporation works through our regional offices and our network of local, state, and federal partners to help communities implement canal projects that improve public access, enhance visitor amenities, create connections to local businesses and help to protect and promote historic canal resources. We also work with communities on canal related events and festivals to help build sponsorship and raise awareness. For more information on the statewide Regional Councils and to keep current on offerings through the Consolidated Funding Application, visit the nyworks website at http://nyworks.ny.gov/ .